The point about condensation is a fair one, but easily handled with a drain or trap. I’ve thought about a similar system for water–when you take a hot shower in the middle of winter, it’d be nice to use the waste water to pre-heat freshwater going into the water heater. That technology exists in commercially available products. It’s a tube wrapped around a drain pipe section. I believe it is even worth a LEED point or two. They sell these at Homedepot actually, its a copper coil that is wound around your drain pipe. They exist, but they are expensive. Lots of copper involved. You also need to install it at the right place in your drain system (vertically), which can be a hassle in some homes. Please check the build-up of dryer lint in the heat exchanger. It may cause a fire. I do love the idea of using the heat before it escapes. Yes, I’ve built something similar. You want a filter upstream of the exchanger. I eventually just scrapped my complicated exchanger setup and put a big “shop vac” bag on the end of the hose and vented the air directly to the house. It would really humidify the house of course, but in winter the air is so dry already it was kind of nice. But if you do several loads in succession expect a lot of condensate on windows and such. Except that the exhaust fan in the dryer can’t support the additional static presure of the heat exchanger and will use more energy to dry your clothes. In the event that it can support the static pressure, the heat exchanger will surely clog with lint. It might catch fire before actually clogging and even if it doesn’t, it’ll void the warranty on the dryer. Great hack, though. yeah.. might make more sense to turn the exhaust tube it’s self the heat exchanger so as to not change the pressure/operation. does make me wonder about dryer design in general though.. there has to be some designs out there (energystar or whatnot) today that are just reusing that heat longer before exhaust or converting it back to energy to be used to create more heat..
That is what I was thinking. Maybe wrap something very thermally conductive around a metal exhaust hose. I know it wouldn’t pick up as much heat but it wouldn’t put an addition pressure load on the dryer. they do exist. the one i have at home, with an a+ rating, outputs air just above room temperature and doesn’t need a tube going outside. condensed water is collected in a tank i have to remember to empty, and apparently that water should be ideal for watering plants etc, though I’ve never felt the need to try. using the exhaust tube as a heat exchanger is not practical since I suppose the flow will be mostly laminar, directing a core of air outwards that doesn’t touch the walls. A suction fan at the window would do the trick, just throw in a SDP610 differential pressure sensor and servo out the pressure drop across the heat exchanger and the dryer won’t see any flow resistance. I know this is an old thread…but I just recently did such a project. My dryer vent goes straight into the floor behind the machine. I simply put a ‘T’ fitting there. The dryer exhausts into the side of the ‘T’, one end goes to the existing vent. The other end of the ‘T’ has a piece of dryer vent hose long enough t get it above the machine and turn 90 degrees. I put an old sock on the end for filtering. It’s probably not the most efficient way to recover some of the lost heat, but it works after a fashion. I can easily clean the ‘filter’ by turning it inside out, and if system gets clogged, the air will simply divert to the original vent. Sounds like a good workable idea. It also gives me an idea for my set-up which is to add a similar T- fitting, one with a damper (an air flow direction changer). This would allow me to easily switch between venting indoors or outdoors depending on the season … although I’d have to insulate the section that led to the outdoors and prevent any cold air from leaking back inside the room. Thanks for the inspiration, jakdedert. My grandmother had a similar arrangement in the basement, but she used old nylons instead of a sock. It worked fine, and I don’t ever remember a smell of mold (moisture is the only concern in recycling electric dryer exhaust) in that house ever. How do you figure it will void the warranty on you’re dryer? The only thing you’re doing is harnessing the waste heat coming FROM the dryer and utilizing it to you’re advantage. This affects the dryer in absolutely no way. Also with a proper lint filtration system (his seemed kind of inadequate) this won’t clog up in the heat exchanger unless you absolutely NEVER clean it. Sorry to argue but you’re argument made absolutely no sense man. Were you just typing just to type? This is a GREAT IDEA! Awesome job man. Pressure across one of those at the flow rates involved is near zero. Or you could just vent your dryer indoors to a cleanable lint trap (I used old pantyhose). Course it’s not up to code and you’d need a fresh carbon monoxide detector nearby if you’re using gas. Why does everyone think these dryers are super susceptible to changes in output pressure? IT DOESN’T MATTER! Back pressure isn’t occurring here and the air flows freely through the flex pipe with no problem. As long as you’re output pressure is leading up and out of the house there is no issue here ONLY a great idea! Dryer running > freely pushes spent exhaust > spent exhaust passes through heat exchanger FREELY with no strain or back pressure > heated exhaust runs up and is deposited outside. If you were utterly convinced that “back pressure” was an issue in affect putting strain on you’re dryer you could easily add an A/C utility fan toward the end of the setup to make DOUBLE sure the output is constantly pulling…but that would be ridiculous overkill. What’s susceptible is the heater safeties, they require a certain volume of air to keep the elements heat output in check, same as a restricted vent, it’s not about pressure, but volume, hooking up an a/c to it would give you the same net result inside the dryer, an overheated hi limit. i’m not sure how much over heating is involved, but a good way to tell is to take the vent off the back of the dryer and turn it on, look at the element, were the air comes into it the coils should cool, barley glowing at all; then hook this thing up and see if there is any difference, if there is, don’t use it, if there isn’t then go for broke and have fun. I disagree with 90% of the commented concerns so far here. Sorry but you’re concerns with “back pressure” and “strain on you’re dryer” are invalid and it’s irksome. I apologize now if I’m offending anyone with my disagreements. I think adding a potentiometer/speed controlled A/C fan pushing ‘outside’ my sooth any concerns of the pressure building up or causing you’re dryer to strain to push the exhaust through the rig. I have a wall-mounted air-conditioner I use for directly cooling my dual i7-990X rig with flex pipe leading from the output of the A.C. unit to the bottom front of the server case with the circulation out the back of the PC case. People ALWAYS ask me if I have an issue with condensation…short answer…NO. I have designed a spill way in the system toward the middle of the flex pipe with a mesh coffee filter and that does the trick just fine. There is no ‘back pressure’ on my A/C unit as it is being pulled pretty thoroughly through the front of my my PC and out the back. My dad built something similar to this project to heat our basement and it worked great for 8 years…this is a great idea and can save a TON of money on heating. Okay here are some issues. How much energy will you reclaim? How much energy does the fan take? Here is the big one. How much energy did it take to make the heat exchanger? That looks like a lot of aluminum to me. Even if you uses 100 recycled al you still have the energy input of heating and melting it. For the heat plant you will want to be even more careful because you may condense some rather nasty stuff out of the flow. It is an interesting idea test with but the practical output seems very low to me. It would probably be better to make sure that you insulate the vent very well and maybe have a plug on it when the dryer is not in use. looked like an intercooler to me too, although the end tanks are horrible. the exhaust needs to be super clean before going through or it will clog up in no time. back pressure on the dryer will have some affect. the dryer was designed to push air through a large diameter exhaust, not a cheaply made intercooler. this would only be a good idea in the winter obviously. and what else is a problem in the winter ? low humidity. and dryer exhaust is both warm and humid, good stuff to have going into your air at home. so just do what i do, and VENT THE F*CKING EXHAUST DIRECTLY INTO THE HOUSE. Wouldn’t it be too humid? Would encourage growth of unknown life? Yes. That’s the best idea. Please vent carbon monoxide back into the home. How does a clothes dryer produce CO? All it does is heat air and blow it over spinning clothes. Not all dryers are use electric heat. Some clothes dryers produce heat using a flame from natural gas or propane sources. This can produce CO. Any CO must go somewhere that is not indoors. the humidity would be beneficial but way to extreme, you would do a load and the humidity would go way up, making you FEEL warmer true, but unless your doing laundry consistently enough to match the heat loss by your house, be ready for long dry spells. of course if you really wanted to do this, get two or three of them, mount them in your duct work, use the furnace fan to move the air and the extra surface area wouldn’t bog down the dryer. but that gets in to the realm of overly complicated rather quickly. well of course, humidity is a relative thing. during the winter putting a large load of clothes in the dryer on high heat adds roughly 15% humidity to the air in my house overall. a little higher in the basement where the dryer is located, a little less on the top floor. (2 floors/finished basement) and yes, i have actually measured this repeatedly with a humidity sensor to get an average number, due to my worries about mold growth and such. 10% added humidity during the winter is pretty harmless, of course take your own measurements based on house apartment size, location and season. if anyone is really worried about mold growth, it should be anyone using the submitted setup. the inside of that dark, moist, warm radiator will be growing black mold in no time at all, and spewing the spores into the air you breathe. basically what this guy has created is a very good fungus growing device. i feel bad for anyone living in his house, they are going to get ill sooner or later. my main point really was though, that %100 thermal transfer of the heat from the exhaust is achieved by simply venting the dryer inside the house. that’s it. no fans, no thermally operated switches, no radiators, no work. just disconnect the goddamn hose and lay it next to the dryer for christ’s sake. Venting directly into the house is only sometime a good idea, e.g. in cold dry climates. Many parts of the world have more mild and very wet winters, keeping the moisture out of the house is a big issueand people spend a fortune running dehumidifiers in the winter to dry the air. Mildew build up shouldn’t be an issue as the “wet” air from the dryer is vented outside. i suppose you missed the part where i said it depends on your location, season, humidity levels ect ect ect…. jeez. Yup, just put an old nylon stocking or pair of pantyhose over the end of the tube to catch any additional lint. BTW – the humidity levels don’t change that much if you have a humidifier alreay in your heating system. I’m with you! My dryer is electric and for years when late Fall comes around (I live in Temperate Zone) I disconnect my alum. flex hose from outside venting extension(block that up with plastic bag filled with soft cloth and mothballs to keep mice form winter nesting in the extension and to keep that cold air from flowing/sinking back into the basement). I re-attach the hose to another extension wired to the cellar ceiling. I screened the end of the inside extension to catch any lint that the normal machine’s lint-catcher doesn’t (which is still in play no matter where you vent the damn machine … so always keep that clean). And it’s a beatiful simple set-up. I’m working on a moisture regulator just in case I need it but I have yet to as the winter air is so dry the moisture is readily absorbed. I work as a Tier1 supplier to the appliance industry. If they could use the excess heat to their advantage (i.e. better energy star ratings) they would be doing it, trust me. There are all sorts of issues including UL requirements, even more so with gas dryers versus electrics. Plenty of fires are caused every year from dryer lint buildup. He has a fairly short run on this setup, but other people don’t. Not knowing the exact run length for the exhaust, appliance manufacturers have to follow best practices, not customizing each setup. The same thing holds true on your car, it is set up for optimum performance based not on altitude, if they would link the GPS data to the air mixture ratio you would get the best performance but they dont. Appliances today are leaps and bounds better than they were 30 years ago. If you have a 30 year old “beer fridge” sitting in your house/garage/basement, understand that you would be better off getting a newer efficient model based on just what it costs to keep that thing cold 24/7. Of course if you only fire it up for parties or during deer hunting season when you whack ’em, stack ’em and pack ’em then that is a different story. For anything required by law to be listed by UL, trust me…the requirements are in depth and crazy for a reason. I have had to read quite a few UL spec’s and i’d rather have teeth pulled. My 1940’s GE uses less electricity then most $1000+ fridges. Copper tubing, highly insulated and real freon. Very efficient. So at least you didn’t say a 70 year old fridge. :) Amazing how technology can get worse over time. What is the useable space in cubic feet of both your refrigerator section and freezer? I bet if you look at the cost per cubic foot on the 70 year old unit to run it, you would be surprised how efficient the new units are. That being said, I had an aunt that had a Kelvinator and she referred to it as her icebox. She bought in new in the 30’s and it was her only fridge to her dying day. Yes, the comment about 30 year old refrigerators was a bit misleading. Moderately old refrigerators may well be less efficient, but really old ones (if still in good shape) may be more efficient. Presumably where it talks about using this for water heaters they are talking about gas water heaters. So how can this do a better job than the heat exchanger already built in to a gas water heater? You can get highly efficient gas water heaters. So how can this be made so cheaply that it is less expensive to add one of these to the venting system (with the labor and safety considerations involved) than to get a more efficient water heater (and pay for itself before the water heater needs to be replaced), and yet built sufficient quality that it will maintain safety and work for years. Umm no that would be less effective and wasteful. They actually already do this but they don’t use any gps. They use air mass sensors or air flow sensors along with pressure sensors. Even carburetors do this to a degree or a cars and planes would work at altitude. A motor doesn’t care if the pressure drop is because you are in Denver or if a storm is coming. It only cares about the mass of air that is entering the system. Like I said if they used GPS to get the best, I know mass airflow sensors are on the system, but there are plenty of variables the airflow sensor does not take into account. Yeah, there sure are. In fact, my engine runs notably better (faster!) at low altitude on cool, boring, humid days. But that’s just because the air is denser due to altitude. And because the air is denser due to it being cold. And because the air is denser because I’m not in the middle of a low-pressure system (boring weather). Everything above is already neatly accounted for in the output of the MAF sensor, possibly with a bit of input from the external temperature sensor. This greater density of air (and oxygen) input thereby allows the engine to inject more fuel to match. And, finally: The results of all of this are compared against the output of one or more O2 sensors, and things are tweaked accordingly to keep the car burning fuel cleanly and (moreso in ODB-II land) the allow catalytic converter to operate efficiently. What other variables need to be accounted for on a daily driver vehicle? Here’s what you do. Reverse the equation, if it’s cold outside. Recirculate the vent air back into the dryer so it becomes a closed system. Have a cooled surface within the closed system that would cause the water to condense out of the air, and drip down into a drain (that are usually located in the laundry room). You could keep the surface cooled using ambient air from inside the house (heating the house in the process) or you could supplement using outside air. I haven’t thought through all of the efficiencies, but I don’t think it’s been done before. When you mount that, as you mention in the video, make sure to mount it on it’s side to take advantage of natural convection. Once warm, your house air will automatically move through the exchanger if it’s given a vertical flow route. Home depot sells these type of things already. Seamus Dubh and jimbob are 100% correct. I have one of these (direct vent) units in my home and appear to be one of the the only people posting with any first hand experience. My relative humidity with the drying on in my 1600square foot home increases less than 7%. We have no basement and the air is output into our downstairs bathroom. Humidity in the bathroom is slightly higher at 10%. In the winter, without the house humidifier running our humidity is normally around 30%. Around 60% you need to start worrying about mold mildew from lack of light. The increased humidity allows us to decrease the thermostat increasing energy savings. That said, I can see this being useful if you had a gas drying that used exhaust to dry clothes? Sorry, google translate error. I did not check. 7% and 10% are the increase in humidity. Additionally “drying” should be “dryer on”. wow, this is so useless, unless you live in a region with 95-100% humidity, just hang your clothes over the night. you don’t need a dryer at all. But I can’t help myself…in the description…it says…hot water heater. How water doesn’t need heating! Hot water does need heating if it is not hot enough … or a little thing called heat loss occurs. You should be ok though I hear it only happens in a place called reality. HOT water doesn’t need heating!!! PLEASE NEVER TRY THIS WITH A GAS APPLIANCE. Not only can you have a condensation problem, gas appliance venting is spec’ed out to match the temperature of the exhaust air, the distance (both horizontally and vertically) the exhaust air has to travel, and the outside conditions. Lukewarm exhaust gases might reach the outside in the dead of winter but, as the seasons change, you might not have enough temperature/pressure difference for a chimney stack to operate properly. When mid-efficiency furnaces started coming into the market, there were all kinds of aftermarket exhaust heat exchangers that hit the market but, at least where I live, very few survive today. Buying a more efficient machine is safer, less noisy, space-conscious, and, in the long run, the cheaper way to go. Friends don’t let friends engineer their own heat exchangers. Of course, an electric dryer is another thing. You probably won’t kill your family with that. Unless you burn the house down in a lint fire. Industrial heat exchangers come with a bypass path to regulate the power extracted and deactivate the unit in case it gets clogged with soot. All the safety certificates that need to be obtained for a model are quite a pain. I’m glad you mentioned this because it needs to be said. Appliances like furnaces (not the 90+ efficiency ones) and hot water heaters use convection to carry away the flue gasses. Remove too much heat, and it ruins the effect. The result is a house full of CO. I find this a bit interesting. I live in the Northeast with a very drafty 112 year old house and being able to pull any kind of extra heat from appliances would be a benefit. Being able to pull heat out of my 20 year old inefficient furnace’s exhaust flue (while maintaining enough draft for the crap to make it out the chimney) would be great. Sure, buy a new furnace, no I don’t have 4k to spend on that. Extracting a little bit of heat from the dryer exhaust would be nice as well, it’s a short run to outdoors and with a proper and easily accessible filtering system before the exchanger you’d be able to to keep lint from building up in the exchanger, add a condensation drain to the bottom of the exchanger and you’d be set. Yes, there’s a lot of conditions and requirements for UL listing a product because they expect something to be used by a normal household user, not a geek. I think with more attention to detail systems like this can be beneficial to a few people, but it’s certainly not a ‘set it and forget it’ kind of deal. I’ve replaced furnaces in old houses. It’s not hard. A furnace of high efficiency and good quality need not be all that expensive. Goodman, for instance, makes a few rather excellent models that also have very good manuals, and they have very middle-of-the-road pricing. Of course, you’ll need to have the whole thing permitted and inspected to suit your local building code and/or insurance dude, but that’s cheap and easy if you’ve done a bit of homework. The hard part (ie: the expensive part if you’re paying someone else to do it) is the duct work to connect it, but it’s fairly easy too. A combination of simple tools, simple advice from the local HVAC supplier that you buy the furnace from, and maybe a magic fitting or two made by the local tin smith (check the phone book) will get it done in no time. Everything else is, literally, plumbing. Magic heat heat exchanger, been around for about 50 years. google it. Interesting hack, but here’s a much easier and more effective variant. We don’t vent our dryer outside. We vent directly into the basement through a length of vent duct and a nylon stocking to catch lint. Heats the basement quite nicely and safely. If you want to figure out if the water will condensate figure out the highest percent relative humidity the air will be and the expected temperatures, then use a psychometric chart for air. A psychometric chart graphs various thermodynamic properties of a gas. For example you can see the what temperature air of a certain relative humidity will condensate. Wow. There’s a lot of misinformation in these comments! Back pressure is an issue, and your clothes won’t dry if there’s too much of it, simply because the blower that moves the humid air out of the dryer isn’t all that powerful. If you doubt me, build this rig and then go outside and see how much air is blowing out of the vent. Not much, I bet. The second concern is that darned white flex hose. The inside gets coated with lint, and by itself, it reduces the efficiency of your drier significantly. Do yourself a favor and replace it with 4″ rigid aluminum ducting. You’ll immediately notice the difference in the time it takes to dry your clothes. How about working on the other side? I live in a place with very hot summers and mild winters. Instead of my dryer pulling cool a/c air, heating it up, blowing it outside the house thereby sucking an equal amount of hot air inside from outside, how about sucking some of the blistering hot air from the attic. It may not even need to be warmed much. It would keep my attic cooler (cooler outside air being sucked in through vent. The cooled air will be more dense and harder for the exhaust blower to remove the air. Also moist lent should quickly clog the heat exchanger since the cooled air will condensate. Without the ability to remove the heat from the system the temperature will keep increasing in the system as resistances increase. This could cause a fire. On the plus side it will take longer to dry your cloths but you will be heating your house longer. This looks like a horrible idea. It looks like a fire hazard. The pennies saved is not worth the risk. Screw saving heat, why am I paying around $10/month to cool my food in my refrigerator when it’s below zero outside six months out of the year? Seems like the money would be better spent on a more efficient drier (or water heater), or a more efficient washer (which would leave less water in clothes), or a laundry spinner (which also reduces the drying time and energy by leaving less water in clothes). I was just looking at the payback calculation on this. The sidebar indicates that materials cost $300, if allow an extra $100 for assembly and installation. They claim return of 2600 watts. gives 1.7 kw-hours reclaimed per load. At electricity cost of about 10c/kw-hour that means savings of about 17 cents/load. Or over 2000 loads to recover investment. At 5 loads/week, and assuming that heat is useful for 30 weeks/year it would take about 15 years for this to pay back. Cost of electricity varies widely, so if local cost higher then would recover sooner. If the drier is located in an unheated location, then additional losses will be incurred in moving heat to useful location). 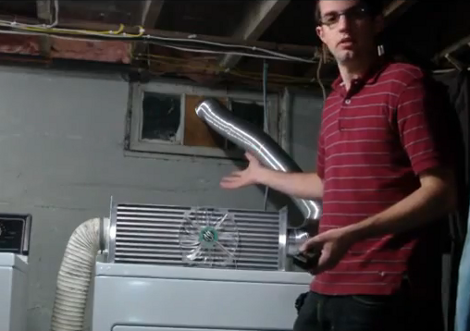 why not mod the dryer to heat incoming air with this…??? I want to do this and store the heat somewhere for later. Finally a good use for eBay inter-coolers. i use one as a doorstop too. marginally effective. My dad stuck a couple of radiators up his wood/coal fireplace chimney, had a pump, valve, thermocouple + controller to connect it into central heating whenever the fire was lit, Bloody Genius it was, worked for years until one-day the controller packed-up, everything got so hot that the solder melted and dumped a couple of radiators worth of water all-over the fire/living room! Still though, a helluva lot cheaper than running gas central-heating! Call me stupid, but – Why does the dryer have to vent outside at all? Old, old thread, but: All dryers need to vent outside primarily to prevent moisture buildup in homes. Not venting outside can readily create mold problems in many climates, which is always bad: Mold loves nothing more than warm, moist air to keep it thriving…although perhaps in a dry Northern winter or arid New Mexico, the extra interior humidity might be a blessing and mold a non-issue. Dust is also a concern — dryer exhaust isn’t exactly the cleanest stuff in the world, and it’s easier (although not necessary) to vent it all outside instead of clean it up inside. Also, gas-fired dryers require an outside vent, just like most other gas appliances do: CO and CO2 emissions and people don’t mix well in confined spaces.